Chhaperia is known for radiant heaters. 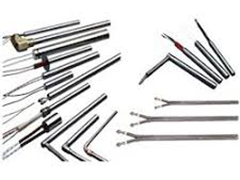 Established as the top radiant heater elements manufacturers, our team invests their time in bringing out the best. As one of the leading industries, we ensure on-time delivery and quality in every element we manufacture. The quality standards by us have taken us to be at the next level of leadership. Our team is the greatest potential, and this became a strong foundation for us since 1994. Supplying globally, we serve many top-notch industries. Heat directly supplied to the floor or panels present on the wall. Through infrared radiation, the heat gets transferred into the house or a room. Radiant heating is an efficient heating method that has fewer duct losses. The electricity usage gradually decreases. The radiant floor heating is of three types: Air-heated, Electric-radiant, and Hydronic radiant floors. As radiant heater elements manufacturers, Chhaperia became a mark in the industry with its outstanding execution. The core team works until the system is perfect in all angles.